Tough 1® 1200D Miniature Waterproof Poly Snuggit Turnout Blanket - Navy Blue - 50"
Made of 1200 denier waterproof, ripstop poly outer shell with 210 denier lining and 250 grams of poly fill. Adjustable Snuggit™ neck allows a more custom fit. 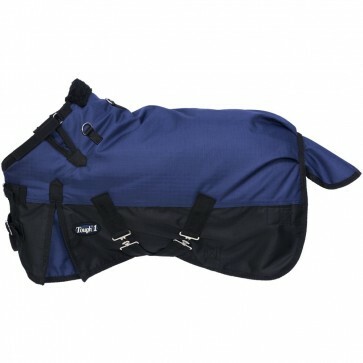 Features fleece wither protection, crossed surcingles with elastic ends, adjustable and replaceable leg straps with elastic ends, double buckle front with snap closure, and a tail flap that reduces tail breakage. Shoulder gussets allow freedom of movement.